MOSCOW, August 29. /TASS/. Federal budget costs for implementation of proposals made by Russian President Vladimir Putin in respect of the pension system changes will amount to about 500 bln rubles ($7.3 bln) in six years, First Deputy Prime Minister and Finance Minister Anton Siluanov told reporters. "The President of the Russian Federation made a series of initiatives to clarify proposals on pension legislation changes, which were prepared by the government and are in the State Duma," Siluanov said. "According to our estimates, financial resources for stated proposals total about 500 bln rubles ($7.3 bln) within the six-year period," he said. Initiatives stated by the President are aimed at improving social security of individuals, in the pre-retirement are in the first instance, and improving social security of pensioners, the official added. Costs will require clarifications of budget plans and projections for the budget of the Pension Fund for three-year and six-year periods, Siluanov noted. 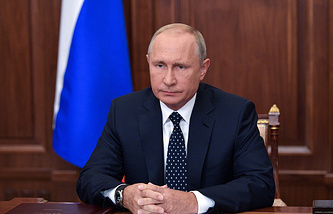 President Vladimir Putin said earlier in a televised address to the nation that he supported the much-talked about reforms to the pension system in general but noted that the relevant draft bill requires serious revisions. He suggested setting the retirement age as 60 for females and 65 for males. The head of state also considers necessary to increase twice the unemployment benefit for pre-retirement age individuals since 2019, introduce preferential retirement in the age of 50-57 for mothers with many children and keep land tax and real property tax benefits for citizens at the level of the current retirement age. Putin also noted the need of introducing employer’s liability for unjustified dismissal or refusal to employ pre-retirement age individuals.